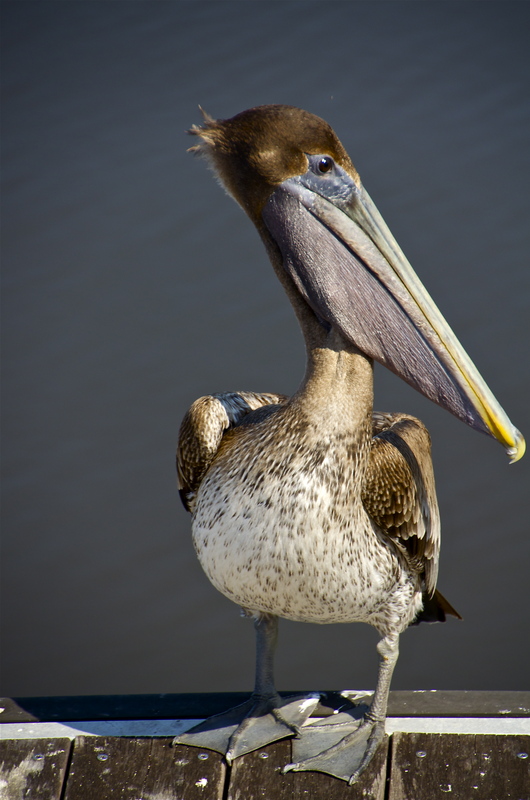 Pelicans are among nature’s most unusual birds. They look prehistoric, dinaourish in fact. Graceful in flight, pelicans are cartoonish on the land. If you want to see pelicans up close and personal, visit Florida. I photographed this handsome specimen at Lake Okeechobee. Half the size of Rhode Island, Okeechobee is the largest fresh water lake in Florida. For reasons unknown to me, tourism is nearly non-existent around the lake. When we visited a nearly abandoned dock there were a dozen or more men and women fishing for supper. The birds and the fishermen occupied the dock in harmony, presumably with the birds anticipating scraps of food. It made it relatively easy to get a few photographs of these wonderful birds. This entry was posted in Photography and tagged Birds, Florida, Nature, Nikon D5100, Pelican, Prehistoric, Tamron Telephoto Lens, travel. Bookmark the permalink. That is one great picture! Wow! That is a gorgeous shot! Thanks for sharing it.